Healthy indulgent menus that include cheese sauce have customers coming back for more. Finding the right mix between eating healthy and indulging in rich, calorie-laden dishes can be a tough balancing act. Consumers desire flavorful and satisfying dishes but also want those meals to keep them on the right track nutritionally. What’s a foodservice provider to do? In tennis, players aim for the sweet spot on the racket. In foodservice, we can do the same! The sweet spot on a plate is the place where flavor and nutritional elements combine to make a harmonious blend of great taste and healthy ingredients. Achieving both culinary goals will keep your customers fulfilled and coming back again. Use whole grain rice, fresh vegetables and our cheese sauce mix for a healthier side. One of the ways to keep indulgence on the menu is by enhancing nutritional food items like vegetables or whole grain rice and pastas with pops of flavor. Specifically, pumping up the flavor with cheesy goodness! Adding an element of creamy cheese sauce elevates “just healthy” to “now we’re talking”! Try whole wheat pasta topped with Three Cheese Mac & Cheese sauce. A perfect example of yummy nutrition. Whole wheat goodness and smooth cheese sauce combine to provide a vehicle for nutritious elements, perhaps by also adding sautéed vegetables or a protein such as chicken or tuna. When talking about healthy indulgence, let’s talk sweet potatoes. Sweet potatoes are very high in Vitamin A and B12. In addition, sweet potatoes provide some additional health benefits like regulating blood sugar, providing magnesium which helps lower stress levels, and aiding digestion with the fiber it provides. What’s the best thing about sweet potatoes? They make great fries, either cooked in light oil, baked as fries, or served baked like a traditional potato. The indulgent part of this dish is Cheddar Cheese Steak Sauce served on the side for dipping fries or topping a baked sweet potato. The rich undertones of steak sauce blends well with the cheddar cheese sauce creating a delicious match for sweet potatoes. Dipping healthy items such as sliced vegetables and baked chips in Pepper Jack Queso is a great way to serve a nutritious side dish, or perhaps even an appetizer. Baked chips are a great bang for the buck, flavor wise and health wise, and are extra satisfying with this spicy, creamy cheese sauce dip. Zucchini strips, sliced carrots, diced yellow and red peppers are all improved with a cheese flavor boost and serving it on the side keeps the guest in charge of portion control. Wanting a main dish featuring a vegetable your guests will love? Roasted Cauliflower Steaks which are made by slicing the vegetable head in half, quickly searing, and then roasting in the oven with seasonings is a unique dish that keeps health in mind, deliciously. Served with a blue cheese sauce, this dish has a rich flavor that is still indulgent with a blue cheese exclamation mark. Of course, raw or cooked cauliflower is always healthy and indulgent with a cheddar cheese sauce topper: another great option for healthier fare. There is no limit to that application: green beans, broccoli, asparagus, or practically any other vegetable you can think of is improved by cheese sauce. 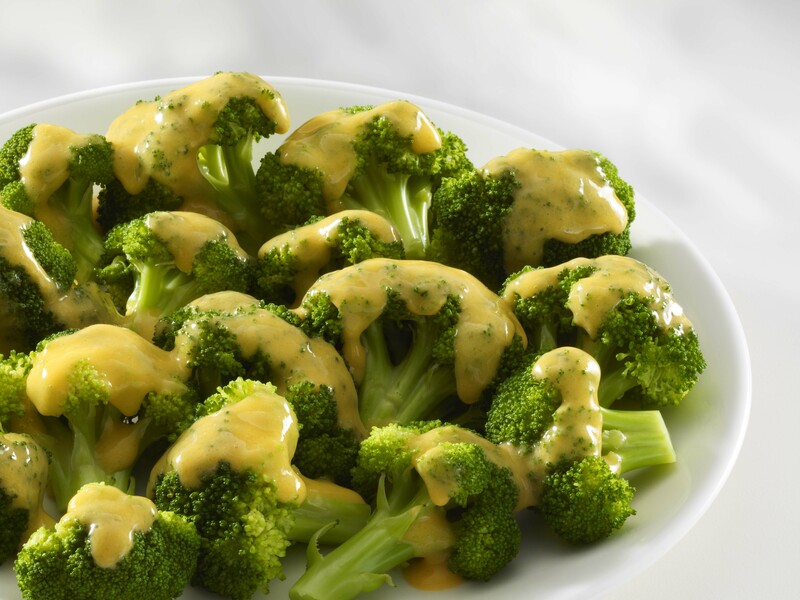 And for every vegetable you can think of, there is a variation of cheese sauce to match your mood. Keeping your menu healthy and indulgent at the same time is critical to today’s food consumers who are very interested in making good food choices. Keeping that balance has never been easier with so many options available to prepare nutritious and tasty fare. Go for the sweet spot on the plate and the results will set your dish above “just” healthy to “wonderfully” healthy.